Split the chickens into halves. Cut out the backbones and remove the breastbones and ribs with your fingers and a paring knife. Blend the salt and pepper, and season the chickens inside and out. Place the chickens skin-side down in a hot, dry 14” ovenproof skillet and brown 5 minutes. Turn the chickens and brown 5 minutes longer, then add the olive oil. Transfer the skillet to the preheated oven and roast the chickens 30 minutes, turning them occasionally. Remove from the oven, drain off all fat, and add the remaining ingredients to the pan. 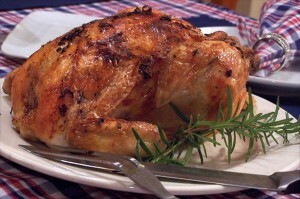 Place over high flame and cook 2 minutes, frequently basting and occasionally turning the chickens. Transfer the birds to serving plates and spoon the pan sauce over them. Glaze the chicken with the marmalade about 10 minutes before removing from oven. You can use just about any jam as a glaze/marinade on savory items. I like plum, apricot, orange and cherry best for chicken. A sweet/tart marmalade is nice on salmon. Jam/Jelly spread over the meat. Bake at 400 degrees about 35 minutes until done. Use leftovers on salad the next day for lunch. This entry was posted in Chicken, Dinner Time and tagged Chicken, Grand Marnier, marmalade, Roast, rosemary. Bookmark the permalink.